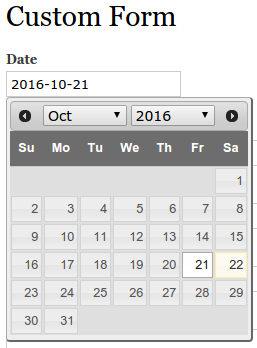 This blog describes how to add date pop-up calender to a custom form in the Drupal 7. The use case is if you want to use date pop-up calendar in a custom form, then how you can do it in the drupal 7. Actually, the drupal 7 form API provides lots of form types like textfield, checkbox, checkboxes etc to create a custom form. Similarly, the date module also provides the form type called date_popup. We can use it in the custom form in order to display the date pop-up in the custom form. '#datepicker_options' => array('minDate' => 0, 'maxDate' => 0) if you want to display only current date. We can hide the future & past dates using this option. Now I've hope you know how to add date pop-up calendar with custom form in the drupal 7.